The USA remains a key ally of Ukraine in the international arena. President Petro Poroshenko believes that the visit of Secretary of State John Kerry to Ukraine is a proof of support for Ukraine by the United States. "Your visit is evidence of the strong support of Ukraine, which the United States of America demonstrated at the most responsible and defining stage of development of our country. It is also a persuasive fact of high trust by the United States and evidence of effective coordination that has been achieved between Kyiv and Washington," Poroshenko stated at a briefing on 7 July. 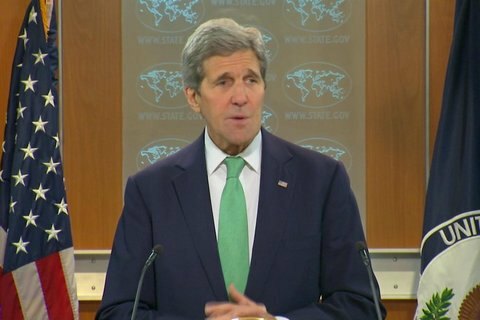 He said he held fruitful talks with John Kerry which delayed the briefing for an hour. Poroshenko also said that the United States remains a key ally of Ukraine in the international arena. US Secretary of State is on a visit in Kyiv. As the People's Deputy Mykola Knyazhytskyy previously noted, the visit of Kerry indicates the strengthening the American attention to Ukraine and Eastern Europe.